Pizza Vesuvius con Jamón, Thyme for Cooking gourmet pizza. Put in a warm place to rise. If making by hand put yeast in large bowl along with all of the rest of the ingredients minus 1/2 cup flour. Stir to combine. Then put on pan and stretch it to fit, patting it out with your fingers. 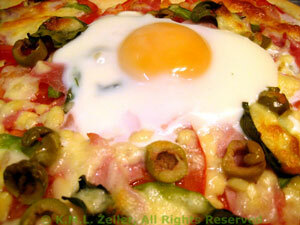 If it keeps springing back wait a few minutes - or accept that your pizza will be slightly smaller than anticipated. Try not to put any holes in the crust. You are now ready to assemble the pizza. Heat oil in medium nonstick skillet and sauté onions, garlic until tender. Add tomato sauce and herbs, remove from heat and set aside. Pit olives if needed, cut in half. Crack eggs and put each egg into a separate small container. On just-finished crust or your purchased crust: Spread tomato sauce mixture evenly over crust. Spread the Prosciutto and olives evenly over the sauce. Bake at 450F (225C) for 12 minutes. Bake an additional 7 - 10 minutes or until crust is golden and egg whites are just set. Yolks will cook faster than expected in the hot oven. Watch carefully the last few minutes so as not to over bake. Remove from oven, cut in half (egg in center of each half) and serve.